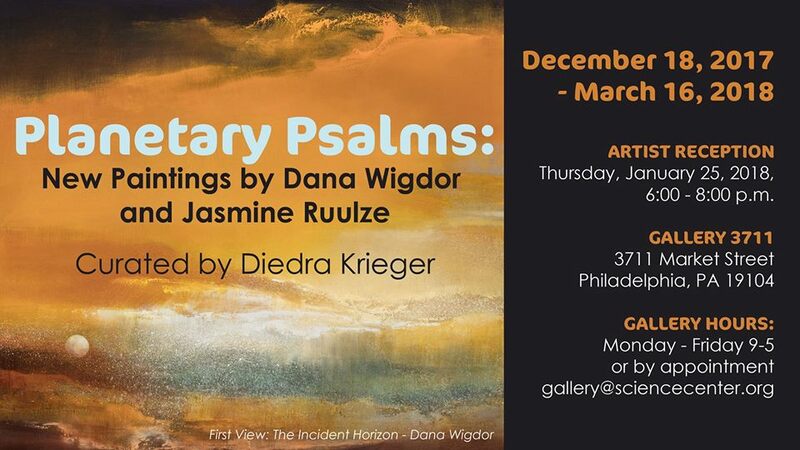 Thursday, January 25th, 6:00 – 8:00 p.m.
Gallery 3711 is pleased to present “Planetary Psalms” of earthly delights and extraterrestrial musings – an exhibition of new paintings by Jasmine Ruulze and Dana Wigdor, curated by Diedra Krieger. Ruulze’s paintings explore the interrelationships of the circle of life and creatures of the “wild” while Wigdor’s paintings take us on an interplanetary journey where an unseen “creature”, or presence ushers the viewer through the darkness and color of deep space. They are doing imaginative work, both invoking lyrical images; Ruulze’s of the natural world’s intersection with itself, and Wigdor’s of an encounter with an unseen presence that radiates as bursts of light. Their sense of play and wonder draws us in. Do Re Mi! They take us on a journey with things we think we know and make them unfamiliar in order to provoke us. Indulgent perhaps, necessary for sure, they invite us to reflect back on our very existence as creatures within the material and ethereal world. Painting serves both artists as the medium of choice to best express their ideas. They are in love with the medium: Wigdor with the luxe, multi-layered surface of an oil painting, applying layer after layer of thick brushwork and sanding it down, works her canvases to find their inner creatures; Rockwell with the quickness of gouache in combination with pencil drawings and markers, draws and paints, releasing for us again and again the myriad images of her active imagination. Wigdor’s painting, “More Than You Know”, starts her series with a lift-off from a cobalt and violet light drenched glacial landscape – the starting place of this emotional, intergalactic journey. Each painting depicts either a solitary planet, or galaxy-like cluster which hovers and connects the viewer to the familiar cosmos of our place in the solar system. Like a solar wind, the sequential paintings are a journey through planes of color and paint spatterings of celestial matter. Dana Wigdor earned her BFA from The San Francisco Art Institute in 1990, and her MFA from the Vermont College of Fine Arts in 2008. She has exhibited both nationally and internationally including San Francisco, New York, Moscow, and Berlin. In 2004 she received a National Endowment for the Arts Creation Grant to produce her solo exhibition “Fugue”. The Fleming Museum and the Brattleboro Museum & Art Center both featured her artist’s talk “The Anthropomorphic Machine” where Wigdor introduced the mystifying creatures that populate her work. Wild creatures big and small as well as flora and fauna provide ritual imagery for Jasmine Ruulze’s day dreams and personal mythology. The symbols and stories of birds, snakes and countless other animals, plants and nature from all over the world fascinate her. A deer’s ear with the sun shining down makes the ear transparent, the veins in the ear shine through, creating a pattern which some leaves, plants and insects mimic. She is mesmerized by these details; everything is related on this earth. This reality allows quite the exploration of interpretation in this series of paintings. Jasmine says she has always had and still has a very active imagination, and just naturally applied that to image making. Growing up in the Adirondack mountains, more or less isolated from anyone her age, Jasmine would explore the land and make up stories in her head. Painting and drawing became the way she told the stories that she had imagined. Today Jasmine still lives in this world created by her own imagination and painting is the interpretation: it is her preferred language. Jasmine Ruulze creates psychedelic voyages using gouache and markers on paper. She has been creating for over 20 years, finding herself in many locations physically, mentally and emotionally. She gets her inspiration from nature, social context, history, family, friends, culture, literature and music. She has attended many artist residencies and is very actively showing her work, past and present. Ruulze lives and works in the South. Diedra Krieger is an intermedia artist and curator working at the intersection of art and engineering. Her ongoing project Plastic Fantastic, a geodesic dome built from 6000 water bottles, is an immersive environment for play. 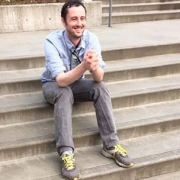 Diedra has an MFA from VCFA and an MA from Monash University in developmental studies, and coordinates projects and outreach for Kod*lab, a legged robotics lab and subsidiary of GRASP Lab, Penn Engineering.